FREE Pollinator Garden Mix Wildflower Seed Pouch! Right now Scout Troops, Schools and 4H Clubs can get FREE Wildflower Seeds Packets as part of the Save Our Monarchs! They’re trying to grow flowers all over and you can be a part of it. This is a great way to celebrate earth day coming up April 22nd. 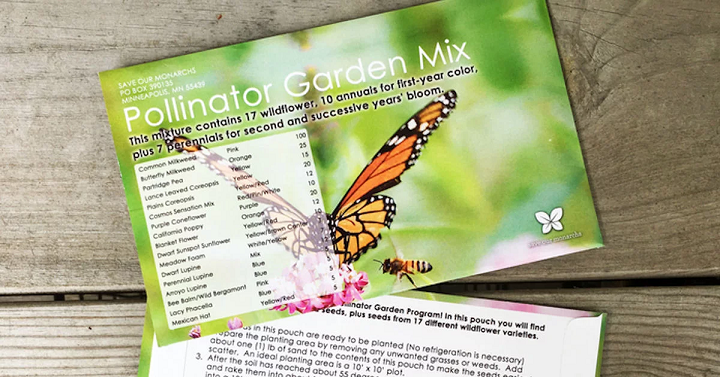 Once enrolled, schools will receive a Pollinator Garden Mix pouch containing 17 wildflower, ten (10) annuals for first-year color, plus seven (7) perennials for second and successive years’ bloom….perfect for children to plant in a Butterfly & Bee Garden!